Well my dear friends, if you are expecting to see a beautiful nature-inspired mantel with lots of pinecones & greenery, the kind that is soooo popular in blogland right now, I am sorry to disappoint you. There's none of that at Random Thoughts this Christmas. Weeks before Thanksgiving, I had this adorable gingerbread-inspired mantel crafted to a "T" in my head. I planned it all out. Sugar plums & gum drops, gingerbread people. I knew exactly how it would look, in my head anyway. When it came time for decorating, I was giddy with delight because, for once, for once, I had a plan for my monstrous mantel. Yeah, well, what's that saying? The best laid plans of mice and men? Yeah. That's it. Instead, I had to regroup & begin again. I'm sure you've heard me mention that "I borrowed this" or "I borrowed that" from my Mom or sisters. Well, this mantel was no exception. I went out shopping. I hit so many stores, it wasn't funny. I did not find a single thing that appealed to me. Then my oldest sister suggested shopping her unused Christmas decor. Glittered green star? Yes please! 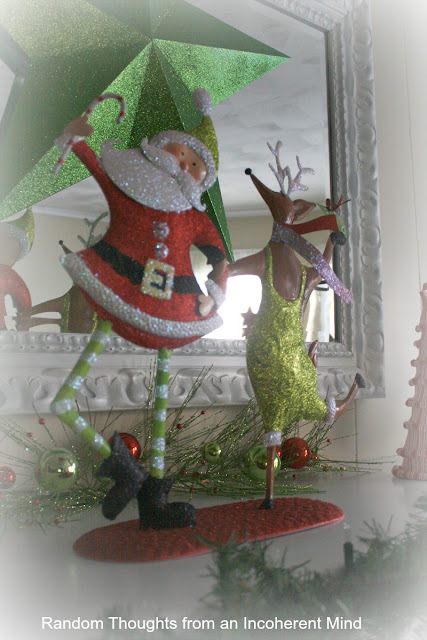 I bought the whimsical Santa & reindeer at TJ Maxx. I thought they would be a nice compliment to the star. After that, I started to add a little of this & that from what I already owned. My mom offered me her red & white peppermint Christmas trees. It may not have been my original plan, but I think it came together fairly well regardless. Of course, none of it would have been possible without my mom & sister's generosity. Gina I love your whimsical Christmas mantel!! The shot with the lights on is so pretty, and I love the pretty ornaments you hung from the garland! Whimsical is perfect Gina. I love Christmas red and light green! The ornaments hanging in front are perfect too! Love it Gina. I have had a few of the vignette failures too. You always do such a nice job! I love the whimsical figures and bright colors. It's so cheery and must make you want to smile each time you pass by it. That's so sweet that you get to "shop" at your mom and sisters' homes too. I love it. I love it, Gina! All the pretty colors and whimsy,,,and not one single pine cone! 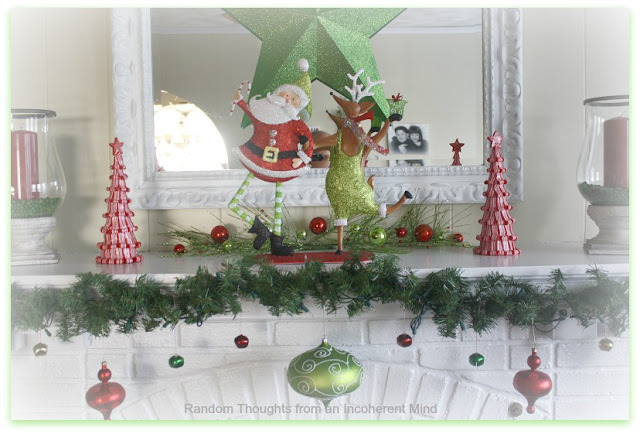 The mantel is lovely, the Santa and reindeer are a fun addition! Borrowing things from your mum and sister is a great idea too. It looks adorable Gina! 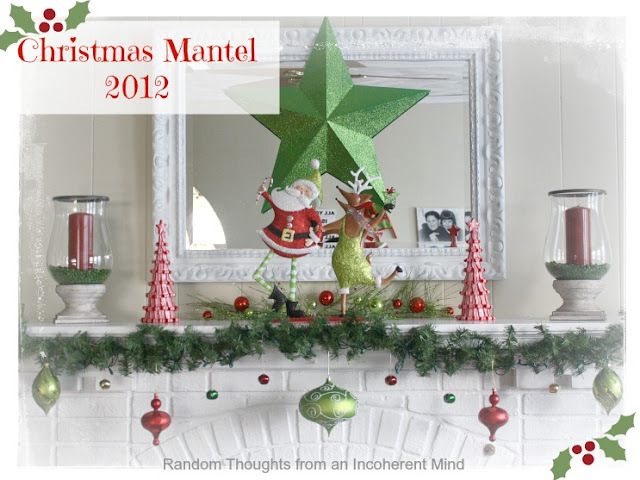 It's a very happy and festive mantel:) How nice that you have your mom and sister to borrow from! So cheerful and festive!!! Love it!! I love your mantel. It has the most happy colors ever! Love the whimsical look. Your Mantel made me Smile. And wish I'm home creating more Beauty to enjoy the Season. Today - rain and the Winter mayhem - it was a good thing. Great, in fact! Apple doesn'tfall far from tree even in decor. Very pretty Gina. such a clean, crisp look. The red and green is so Christmas. Love the glitter! I think it's perfect! I love whimsical. :o) The one thing I especially think is wonderful is that when I saw it, I smiled. Thank you for that! Well, Gina, it's cheery and whimsical; and perfect all the same! You still did a beautiful job...the mantel is wonderful! Gina, I love it! You are so blessed to have a mom and sister with such great taste. You know, none of my projects turn out the way I think they will. Funny, everything is always great in my mind haha! You know... a Christmas decoration swap with friends might not be a bad idea. I'd go. I have plenty of greens I'd trade out for something new and exciting. :D What a glitterific mantel!!! It's so whimsical and cute. I love it!!! Your decor is so pretty, and I like the variety of vignettes around your home!!! You rock! It looks very pretty G. I know when I try to plan. Nothing happens. I have to start decorating and let it come, otherwise I get stuck! Borrowing and swapping is the perfect solution. I know I have totes full of things. I never use everything. Your moms peppermint trees look perfect. So very cute!! 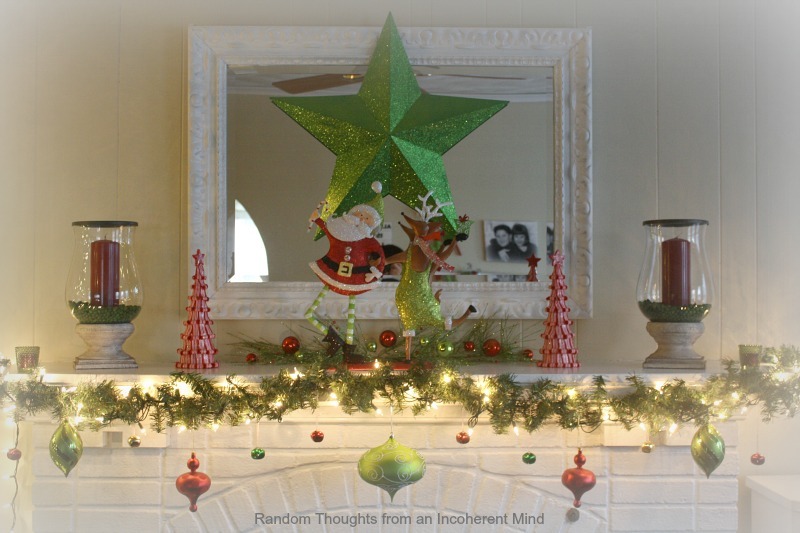 I adore your whimsical mantel, Gina! The Santa & Reindeer is so darn cute! You won't find much of that nature-inspired, woodland decor around my home, either! Ahh, such a happy mantle:) I like the hurricane lamps too. I have some that are similiar...maybe I'll go paint them and do that. Maybe..
Whimsey is good....really good. Since when do you follow trends....you usually set them my dear!! That mantel is just so fun and colorful. I love the fun characters and how it just pops against the white brick. Oh I just love your mantel this year Gina. Very cute and colorful! Gina, it is adorable, love the reindeer and Santa so cute! I hung ornaments from my garland too but now that I look at yours I see I need to add some little ones along with it too! You always do a great job! Gina, I don't know what you had planned, but your mantle came out gorgeous!!! 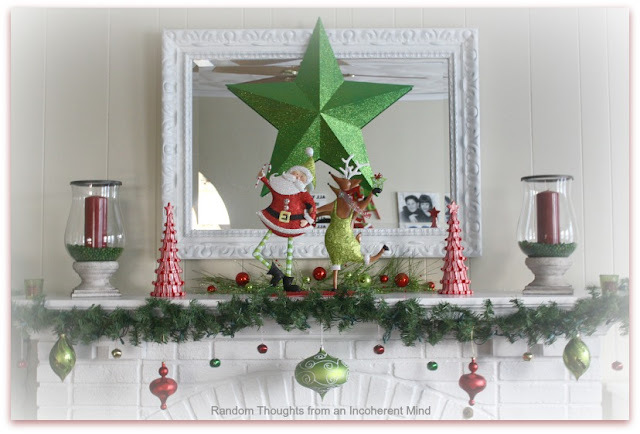 The green star and all the beautiful accents give it a beautiful whimsical look. The garland and ornaments is perfect! You always do such a beautiful job! How nice of your sweet family to let you "shop" for just the right items that you needed to pull it all together. Hope you are enjoying this wonderful Christmas season. It's adorable, Gina!! Love it. May I borrow it for next year? Gina, I love your whimsical mantel. 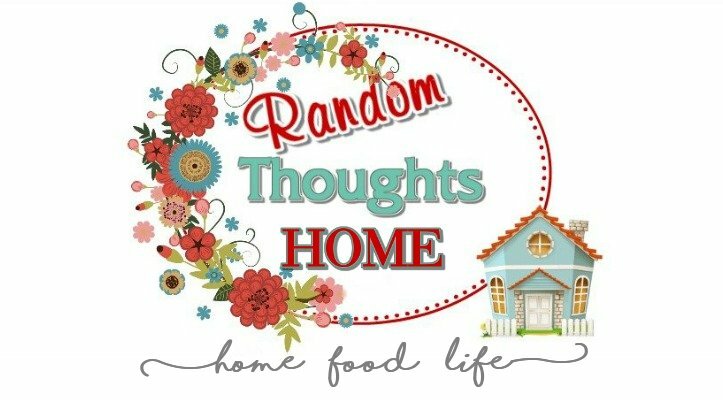 Thanks for sharing it over at our Home for the Holidays link party.